Breton reached out to us just before the beginning of 2019 with an issue he was having with one of his service providers. He indicated that his website was completely down and not reachable and was lost on what to do. We promptly called Breton back and let him know that “all was not lost”. We were able to use an online website – archive.org – to see what his website looked like prior to it going offline. He was very pleased to know that the content and material of the website was readily available so they did not have to completely start over. After the new year, Breton contacted us again and said the provider was able to get their website restored but still wanted to have the website fully re-created and hosted elsewhere with more reliability. During the process, we also upgraded / optimized the website including an SSL security certificate, resizing images to proper sizes, and removing excess pictures from slideshows. We also added a market ticker on the site and a few other changes. Today, the website has been approved! There will be additional changes to the site as they begin some marketing campaigns. We appreciate the business from Breton and his trust in us to deliver reliable services with our mirrored web servers and automatic backups of websites! 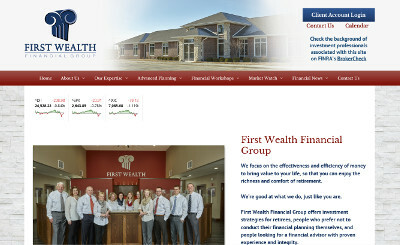 The website for First Wealth Financial Group is at firstwealthfinancialgroup.com.